The significance of findings from a qualitative Tasmanian study, which investigated the part played by informal learning in positive ageing, is highlighted by the increasing proportion of the Australian population in the "Third Age" cohort of active, independent people aged 65 years and over. Semi-structured interviews, conducted by a researcher of a similar age, allowed respondents to speak freely about their perceived needs and expectations for a satisfying lifestyle, in the context of their membership of community-based organisations. 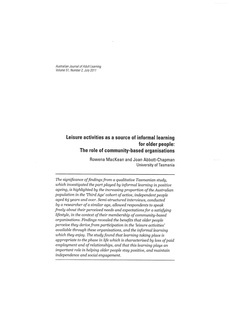 Findings revealed the benefits that older people perceive they derive from participation in the "leisure activities" available through these organisations, and the informal learning which they enjoy. The study found that learning taking place is appropriate to the phase in life which is characterized by loss of paid employment and of relationships, and that this learning plays an important role in helping older people stay positive, and maintain independence and social engagement.